Clean, drinkable water flows straight from the tap. Production of the 30 billion plastic bottles that entered the waste stream in 2006 (fewer than 20% were recycled) used the equivalent of 17 million barrels of oil and created 2.5 million tons of carbon dioxide. Three gallons of water were wasted for every gallon bottled. Bottled water standards may be weaker. Manufacturing and shipping a one-liter Fiji bottled water produces half a pound of global warming pollution and uses almost seven times as much water as the bottle contains. Reusable plastic containers can be linked to health problems. Water filters work on removing many common contaminants from tap water. We have used a Brita water pitcher for years. I am concerned about the filter which I monthly throw into the trash. I wish that those could be recycled. 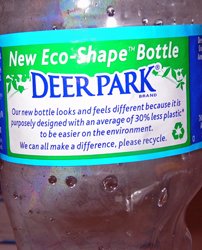 Thanks to the Environmental Defense Fund for supplying these pertinent facts about bottled water. 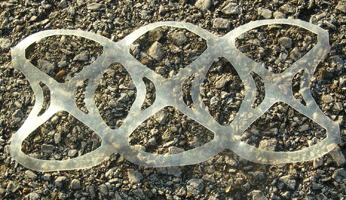 Years ago when the dangers of litter to wildlife became apparent, these plastic rings around cola and beer cans were the first item I remember being mentioned. The plastic rings of death continue to be used by cola and beer manufacturers and tossed into the environment. When I bought bottled water, I added lots of these in the trash bags for the landfill. I wonder how many plastic rings of death have made it to the Great Pacific Garbage Patch? As I was plodding my way through security, at least two dozen plastic bottles of water were left behind by travelers. What does TSA do with all the bottled water, toothpaste, deodorants, shampoos, etc. that are confiscated as possible modes of taking down airplanes? I hope that they recycle.